Trompe L'oeil Artist. 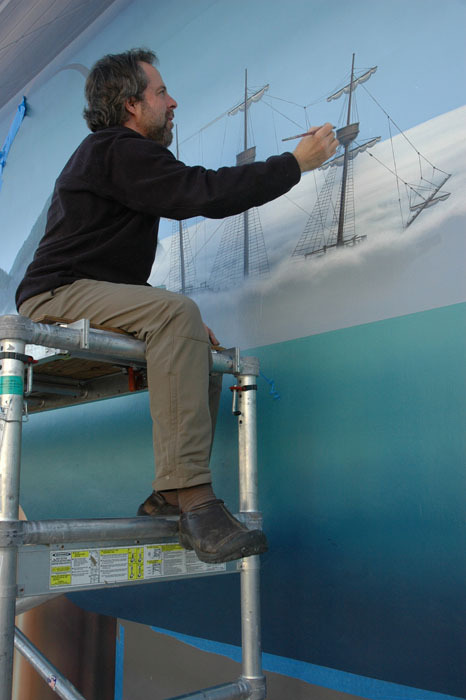 American Muralist. Optical Illusion Painter. 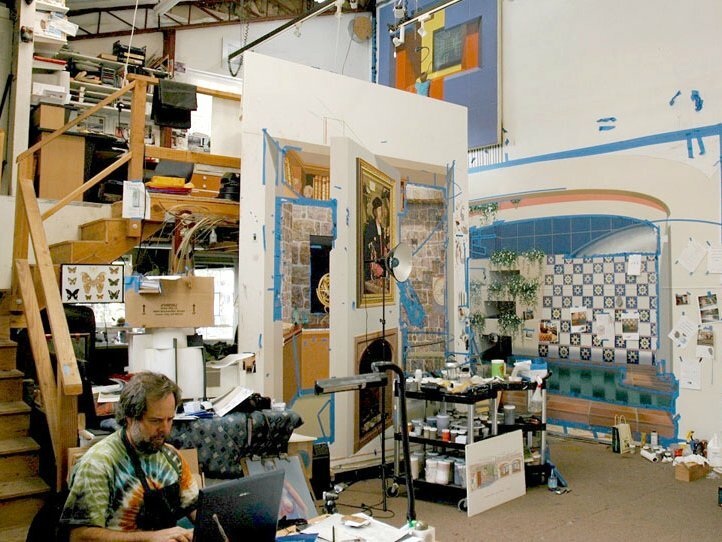 “For more than three decades, world-renowned trompe l’oeil artist John Pugh has engaged and captivated the public with large-scale mural projects in spaces across the world, including San Francisco, Miami, and New York, as well as Taiwan, Mexico, and New Zealand. His “trick of the eye” murals cleverly fool the viewer into seeing a modern facade’s broken wall revealing Greek columns or a woman reading in a cafe. But Pugh’s paintings also capture the imagination and engage the mind. Within a framework of artfully rendered illusionary space, he orchestrates layers of historical, social, and mythical commentary that challenge the viewer to find deeper levels of meaning. I am a trompe l’oeil artist focusing primarily on public art. I have found that the ‘language’ of life-size illusions allow me to effectively communicate with a very large audience. People take delight in being visually tricked. Once intrigued by the illusion, the viewer is invited to visually cross into the mural to explore and discover the deeper concept of the piece. I have also found that by creating architectural illusion that integrates with the existing environment both optically and aesthetically, the art transcends the separateness that public art sometimes produces. Clarity of language allows the artwork to ‘elevate rather than alienate’, and with an initial trompe l’oeil impact that tantalizes the viewer, no translation is needed. Yet layers of heritage, the human spirit, or of dreams can be woven together in innovative ways — dynamic or subtle — that will inspire. I like to play with the mural composition so that the layers will unfold sequentially, creating a multi-dimensional narrative and prompting exploration. I also like to treat the layers as music, composing with color, texture, and form to create melodic overtones and the timbre.Ultimately the goal with the mural is to conjure fresh feelings and perceptions, and evoke a sense of connectivity with the mural, within us, and the world around us. My studio is located high up in the Sierra Nevada mountains, near Lake Tahoe and the town of Truckee, California. Here, amidst towering pines and cedars, snow-covered peaks, and pristine alpine lakes and rivers, I am immersed in beauty. My studio is a haven for friends, apprentices, and master painters alike. Pot lucks and informal round table discussions have helped create an important community center for artists. Patrons and clients are encouraged to come by, discuss ideas, and see projects in progress. Interested in working together? Have questions about commissioning artwork? Let’s connect! 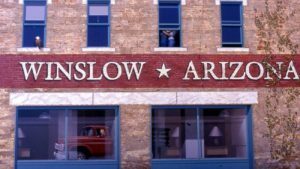 Public art commissions for outdoor spaces, shopping and financial districts, historic buildings, parks and recreation facilities, and redevelopment zones. 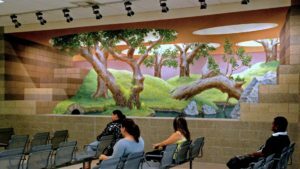 Interior and exterior murals for private and government organizations. Universities, hospitals, museums, corporate headquarters, public transportation buildings, parking garages, and more. 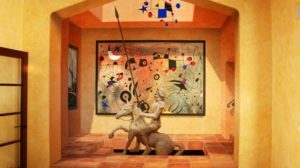 Private commissions for trompe l’oeil enthusiasts, art collectors, and anyone else who shares my love for tricking the eye.